Hey friends! I have something very exciting to share with you. Some of you may have noticed (if you’ve recently received a pair of ZX shoes or follow Zou Xou on social media) that the artwork on the dust bags and postcards has changed. The new artwork is a result of ZX’s collaboration with illustrator + designer Daiana Ruiz. I am so pleased to share this with you because not only is Daiana an extraordinary illustrator but also because her work expresses something which reflects the current social + political climate. To give you some context, last year policymakers in Argentina (where ZX shoes are made) voted against making abortion free and legal. Tens of thousands of women flooded the capital’s streets dressed in green—the color of the ‘Aborto Legal Ya’ (Legal Abortion Now) movement—to demonstrate on the eve of the vote. Together with the Ni Una Menos (Not One Less) march against gender violence, a powerful resurgence of the women’s rights movement in Argentina has emerged which parallels the one taking place in the U.S.
Not only does Daiana’s work challenge the patriarchy in the obvious ways (like the free downloadable poster art she made available to her Instagram followers for the Aborto Legal Ya march), but also in the way she uses fashion as a medium to communicate resistance. From the choice of clothing and hairstyles to the body shapes and complexions, Daiana’s work aims to break deeply- ingrained cultural standards that oppress, exclude and marginalize women, people of color and the LGBTQIA community. When I first came across Daiana’s artwork I fell for the colorful-but-minimal fashion aesthetic — but there was also something else: The women in her illustrations all seem to project a sense of strength and joy in their beings. I love that the women in her illustrations are often women of color; I love that they proudly wear graphic prints and bold colors on their warrior-like bodies. I was drawn to the powerful and confident attitudes they embodied with their knowing smiles and contented gazes. When I was looking to redesign the packaging, I wanted the artwork to reinforce that ZX exists to empower the wearer through the expression of her individuality. That is why Daiana was the perfect collaborator on this project. Not only is she an outspoken and powerful woman herself, but she is also a stylish and a gracious host. 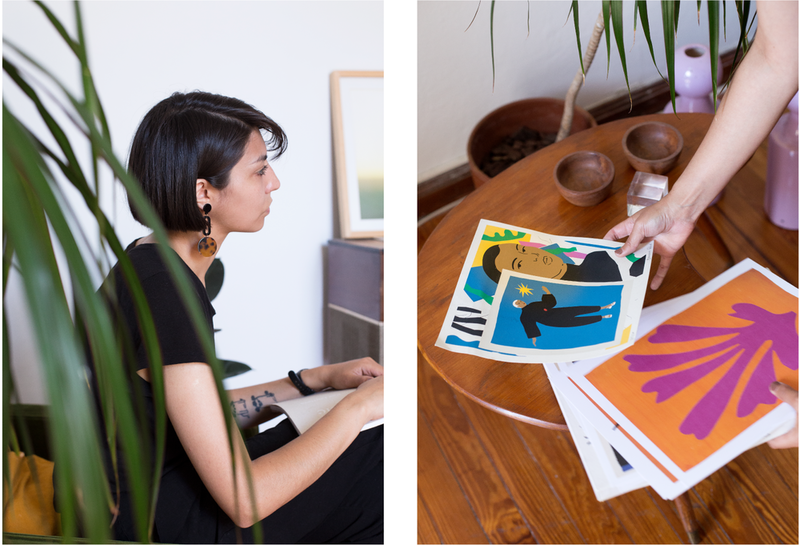 On a sunny day in October, Daiana showed us around her Buenos Aires loft apartment and talked to us a little about what makes her tick. Katherine: You draw fashion figures in contemporary clothing yet you intentionally draw women with slightly oversized proportions that break conventions of fashion illustration. What inspired you to start drawing women’s bodies this way? Do you consider your work feminist or political? Daiana: I try to draw women outside of patriarchal stereotypes. I actually don’t think that their bodies are oversized. They are bodies that shatter social oppressions. Everything we do is political, and I am a feminist. 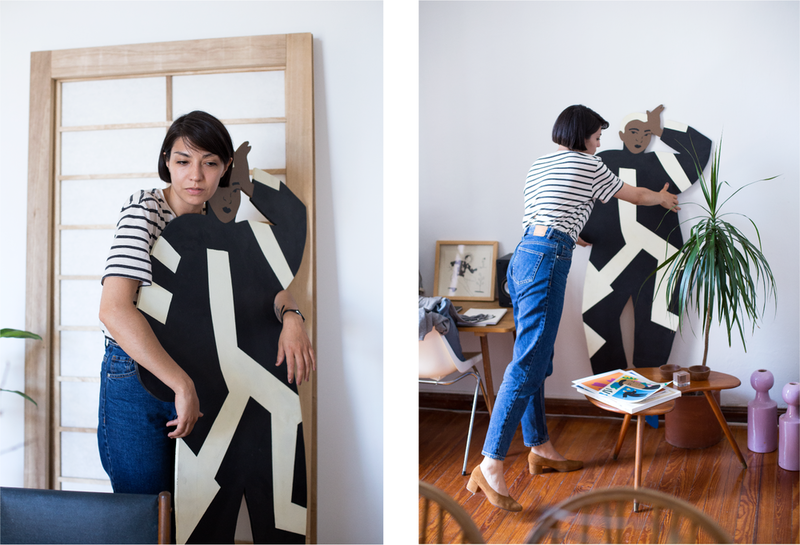 Left: Daiana with a life-sized version of one of her illustrations from a past show. Right: Daiana rearranging objects in a simply decorated corner of her loft apartment wearing the ZX Belu Pump from a past season. Katherine: Tell us about your childhood and upbringing--- what early experiences or influences brought you to where you are now? Daiana: I was always supported by my family to do what I love. Although It’s very different from my parents’ profession, they always encouraged me to move forward with my wishes. That was and continues to be fundamental to me. Daiana: Waking up very early in the morning, having a coffee while gazing at the sea. Wrapping myself up [in something warm], drawing, eating and going to sleep. Left: Some prints by Daiana and others artists arranged on a living room credenza. Right: Daiana puts the finishing touches on her outfit with the Glove Flat in Black Glaze. Katherine: Your home is very serene and minimal yet it has touches of color and pattern that make it feel like an extension of your artwork. How do you choose objects for your home & wardrobe? What principles guide those decisions? What are some creature comforts that you would rather not do without? Daiana: I shop a lot on the internet or at flea markets. I search for specific items and when I find them, I buy them if I can afford it. I don’t need any luxuries, I simply need everything to be in order. I do have a lot of shoes though. 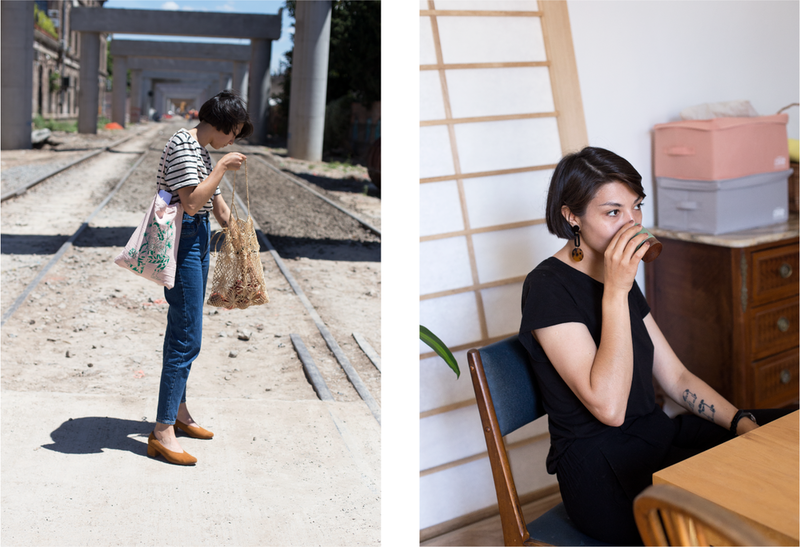 Left: Daiana’s eye for pattern and space is evident in her wardrobe and home; Above she tries on the Glove Flat in Leopard. Right: A wall in her studio simply adorned with some of her work. Katherine: What are some things or experiences on your wish list at the moment? Daiana: I would really like to go back to Europe and perhaps stay longer than the last time I visited. I would like to do some sort of an artist residency or work there somehow. On my last trip I was surprised by the warmth [friendliness] of Lisbon--I would like to go back there. Left: Daiana trying on the Glove Flat in Leopard Pony. Right: Objects neatly arranged on a midcentury modern style record player console. Katherine: What does success mean to you now? Has your definition of success evolved from when you were younger? Daiana: For me (and I think for most people), professional success is doing what I’m passionate about and being recognized for it. Being able to express my point-of-view and generating some sort of positive impact on society even if it’s just a within a small group of people. Katherine: What is your dream project? Daiana: To make an illustrated book about cultural and genetic diversity. Above, a folded pile of Daiana’s comfortable but stylish uniform of denim and tees; the ZX Belu Pump in a past season color and the Glove Flat in Leopard Pony; A poster Daiana designed + illustrated in the color green for Argentina’s ‘Legal Abortion Now’ August 2018 march. Katherine: Do you have any habits or rituals for connecting to your creative spirit? Daiana: When I need to get inspired I like to look at illustration books of the human body. The shapes of contorted bodies always make me feel like drawing. Katherine: What have you been reading lately? Are you reading it for pleasure, knowledge or inspiration? Daiana: Right now I’m reading Putita Golosa by Luciana Peker [ The book is a collection of feminist essays about sexuality written in Spanish ], and I highly recommend it. I read for pleasure, knowledge and inspiration. Left: Daiana Ruiz in the streets of Buenos Aires wearing her uniform with the ZX Belu Pumps and the ZX x Dai Ruiz limited edition tote in pink. Right: A close-up of the tote. Katherine: Tell us about a recent experience that has changed your perspective about something. Katherine: Who are some women you admire? Why? Daiana: I admire strong women who in spite of limitations or barriers move forward with their wishes. I admire my friends, the women in my family and the women I collaborate with on projects. Left: Dai standing on a street close by her Buenos Aires neighborhood. Right: Dai sipping coffee at her dining room table. Katherine: What do you wear when you want to feel powerful? Daiana: I think the most important thing to feeling strong is comfort. I’m super-comfortable in oversized clothing and in garments that don’t over-emphasize my body. I don’t like low necklines or clothing that is super short or tight. I use jeans and t-shirts. Basic but comfortable. Katherine: Does your self-esteem as an artist come naturally or did you have to work on it? Do you have any tips for developing creative instincts? Daiana: I honestly don’t think my artistic self-esteem is that strong. I simply try to let my wishes and motivations guide me. That would be my advice. A collection of screen grabs from the @zouxoushoes Instagram feed featuring ZX shoes being unboxed with Daiana Ruiz’s postcard and dustbag designs.